If you haven't already, please read my previous post on DIY Abby Cadabby Birthday Party: Boutique Style Birthday Hat #Tutorial . There you can see pictures of the party and a tutorial on the Boutique Style Birthday Hat. I found these cute little Abby Cadabby Party Favor boxes for the kids that I needed to fill. I added some snacks, stickers, and a Sesame Street mini activity book. I needed to fill them a little more so I decided to hit the dollar store and see what I found there. I couldn't find anything that quite matched my theme so I took some mini clay and bubble containers and personalized them. The best thing was that they were each 5 for a dollar or 20 cents a piece! I measured the existing label of each item. Using an image editor (I used Paint Shop Pro 9) open a new file the same size you just measured. Using the fill tool, color the image the color you want it. Use the shape tool to put some stars around the background. Print out as many as you need to cover all of your favors. 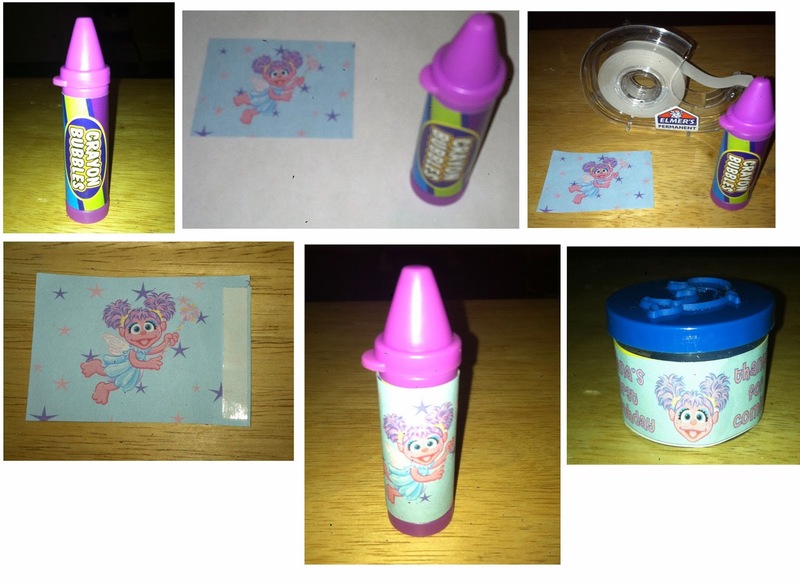 Cut out carefully and using double side tape, tape onto party favor. These customized party favors are adorable. I hope you had a great party! These are so cute. Visiting from Craftdictator. Thanks for coming for a visit this morning. I love your post. Very creative!!! these party favors are adorable! I bet your guests loved them! This is awesome! We have done this before around the house. Great Tutorial! Those are adorable! 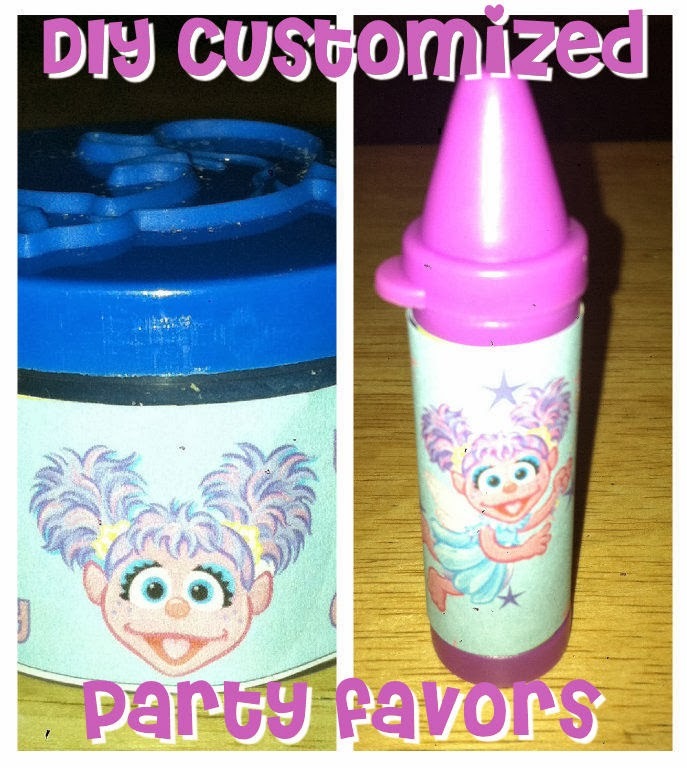 The kids would definitely go crazy over these cute party favors. Anything you can make yourself and save money is great! Personalized to the event is even better! Super cute! What a fun project to do for your little one. Seems easy enough for me myself to do. Great idea! WHat is the blue container? Is it play doh? What a thoughtful way to personalize a child's birthday and make it special. Nice job. What a cute, affordable idea! You could even personalize each favor with the childs name, to make it really special! I love me some DIY, cute stuff! FUN! Looks like a very frugal way to have some great bday party decorations! I have done this many times depending on the party theme! That's a great idea! I really want to have a Thomas the Train party for my son, but the birthday supplies get really expensive. If I make it myself, I would save a ton! This is a really cute idea, and a good way to save a little money on the party! Thanks for the ideas. Cool. Double-sided tape can be a good friend for soooo many crafty projects. Those are pretty cute.. my kids didn't have them when they were younger..
Great tutorial. Thanks for sharing!! What a great giveaway!!! I originally thought you had found them that way when I first saw the picture! I can't believe you made them!! looks great! Adorable and affordable! Thanks for sharing! These are so cute. I would have never thought to do this. I am so excited for a reason to make these. Hrm maybe my daughter and I will just because. That is a great way to personalize a affordable item! Thanks for sharing. My kids love Sesame Street! Adorable party favors! Thanks for the cute ideas! What a great idea! Love how you took something generic and made it match your theme. This is such a cute and fun idea! And it's economic, a huge plus when planning a party. Why do I never think of this stuff? So smart! The dollar store can be a gold mine for party favors and I love how easy is is to make them personal. Aww, that is so cute. Thanks so much for sharing. My daughter would love it. Super cute! I am such a big fan of making something special out of something ordinary! These are right up our alley. Thanks for sharing! What a great idea for a party favour! Those are the cutest party favors, so creative. I love Sesame Street. My kids used to love that show. Hope you had a great party. Oh I am commenting on behalf of my friend Tiffany from Naturally cracked! Oh gosh, you could do your child's favorite character pretty easily this way. Love the idea for a birthday party! This is such a cute idea! And it makes it so easy to take something simple and personalize it! Thanks for sharing! This is very practical. I'm sure children would love this. It's also easy to do and you can customize according to the theme. Awesome idea! I'm just starting to plan Babe's first birthday party now. This will definitely help. Thanks for sharing! LOL! I know right?! I have a tiny creative bone but nothing like I have seen around the blogging world! This is super cute! I will be planning a birthday party next month! This is such great idea. Super cute and crafty! Wow! You just made that so easy with those few steps. I would love to customize my sons birthday party gifts but I thought it would be so much work, so I never really tried it. I haven’t used the program you suggested but I can use some other software that I’m accustomed to - thank you! That is beautiful plus it is is very affordable. My baby is turning 2 on the 13th. Great project for the littke ones.